Priya Kumar is a doctoral candidate at the College of Information Studies at the University of Maryland, USA, where she studies the intersection of families, technology use, and privacy. Her dissertation research focuses on the privacy and surveillance implications of parents posting pictures of their children online. 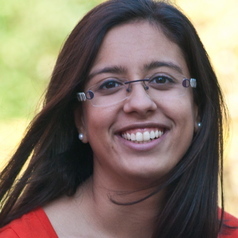 Priya has published research in various journals and conferences proceedings in human-computer interaction, information, communication, and internet studies. Her research has been referenced on NPR, Buzzfeed, Slate, the Washington Post, the Financial Times, and Time. Before returning to Maryland, Priya worked on the Ranking Digital Rights project, which evaluates the world's largest technology companies on their respect for users' rights to freedom of expression and privacy. Priya holds a master’s degree from the University of Michigan School of Information, where she designed her own curriculum in data storytelling. She also holds bachelor’s degrees from the University of Maryland in journalism and government & politics. Find Priya on Twitter @DearPriya and at priyakumar.org.